Located in the crater of a huge extinct volcano and boasting spectacular scenery and an abundance of wildlife, Pilanesberg National Park, the fourth largest reserve in South Africa, is fast becoming one of the country’s most popular destinations. Easily accessible from Johannesburg or even as a day-trip from neighbouring Sun City, a Pilanesberg safari offers the chance to spot the Big Five as well as other iconic African wildlife in one of the most attractive locations in the region. The park contains almost all of southern Africa’s large mammals. The Big Five — elephant, rhino (both black and white), buffalo, lions and leopards — are present, as are hyenas, cheetahs, giraffes, zebras, antelopes and hippos. The rivers are also home to populations of crocodiles. Birding is excellent and over 360 species of bird have been recorded within park boundaries. Pilanesberg is considered to be among South Africa’s most beautiful parks. Lying within three concentric rings of hills that make up the crater of a long-extinct volcano and located where the Kalahari meets the lowveld, the landscape is varied and dramatic. Pilanesberg is the fourth largest protected area in South Africa with over 200km of roads available for self-drive safaris. For a large park with such a variety of wildlife, there are relatively few camps and lodges. 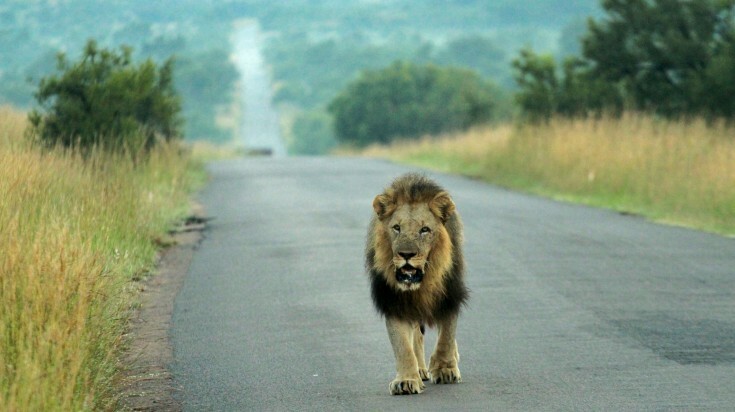 However, at peak times, you are still likely to see plenty of other vehicles while out on your game drives. Leaving the designated roads and driving off into the bush is strictly forbidden. The usual combination of self-drive and guided safaris is the main attraction at Pilanesberg. The park boasts around 200km of roads, most of which are unsurfaced but well-maintained, making them accessible to regular road cars. Most of southern Africa’s species of large mammals are present and Big Five sightings are very much possible, although not necessarily all five in every visit. Other animals to look out for include hyena, giraffe, hippo, zebra and many others. 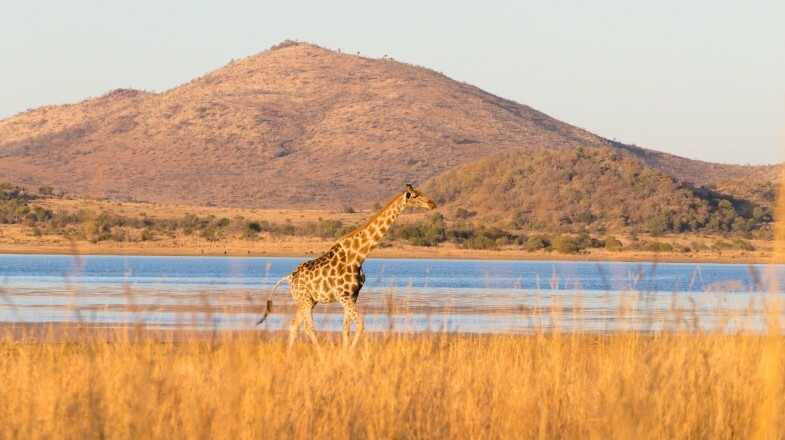 Located as it is in the crater of a huge extinct volcano and in the transitional zone between the Kalahari and the lowveld, the landscape you drive through while on safari in Pilanesberg is likely to keep you just as enthralled as the wildlife. Beyond the classic car safaris available at the park, other activities are limited but some possibilities do exist. For those who want to experience the African bush from a different perspective, guided bush walks are available. These hikes through Big Five country vary in length but generally last around four hours. Experienced guides will be able to give you deeper insights into the habits of the predators and prey that call the park home. For those looking for a truly original way to see the park, it is possible to take to the skies for a one-hour hot air balloon safari. 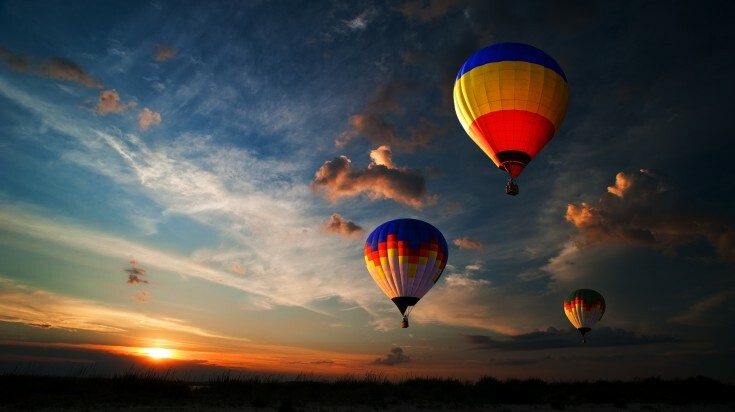 Floating serenely above the park in a balloon will give you the chance to spot all of the iconic wildlife while fully appreciating the scope of the landscape of this geologically-important area. May to September is the best time to observe wildlife in Pilanesberg. This is the driest period of the year in the region and the sparser vegetation makes it easier to spot animals. Coupled with this, animals are drawn to waterholes to drink, making sightings more reliable than at other times of the year. However, this period also corresponds with South Africa’s winter and mornings and evenings can be cold. Months outside of this period are warmer but from December to February, temperatures can be uncomfortably hot. A stay of at least two or three nights would allow ample time for several drives out into the park to spot the more elusive animals. Obviously, the more game drives you do, the more chance you have of catching sight of the animals you really want to see. Many accommodation types are available at Pilanesberg, ranging from permanent safari tents to five-star lodges. However, there is no real budget accommodation such as camping and caravanning sites and even the safari tents offer a certain level of comfort, featuring proper beds, camp chairs and carpeted floors. At the more affordable end, chalet and safari tent accommodation is available at two of the camps in the park — Manyane Resort and Bakgatla Resort. In addition, Pilanesberg Tented Safari Camp offers safari tents only. For a more luxurious experience, there are a number of lodges located within the park, many of which boast swimming pools, spas, restaurants, tennis courts and the like. If you want to be truly pampered, you can opt for the sumptuous Tshukudu Bush Lodge, which offers gorgeous views and includes a five-course African-inspired meal every evening. Unlike most national parks in South Africa, Pilanesberg is not administered by South African National Parks – it is administered by the North West Parks and Tourism Board. From April to August, gate opening times are 06:00 to 18:30; from September to March, times are 05:00 to 19:00. The park is considered to be free of malaria. Known as a place rich in animal diversity where almost all of southern Africa’s most distinctive species can be found, a Pilanesberg National Park safari can offer spectacular close-up encounters with wildlife against a backdrop of an ancient volcanic landscape by day — and the chance to relax in peaceful and luxurious surroundings deep in the African bush by night.